What started as a simple Thanksgiving meal for a few dozen people has grown into the largest Thanksgiving outreach program in Southwest Florida. In the past 10 years, this little Lutheran/Episcopal church has served over 65,000 Thanksgiving meals. Last year’s Feeding the 5,000, named after a miracle of Jesus, delivered more than 6,000 dinners to local families in need. 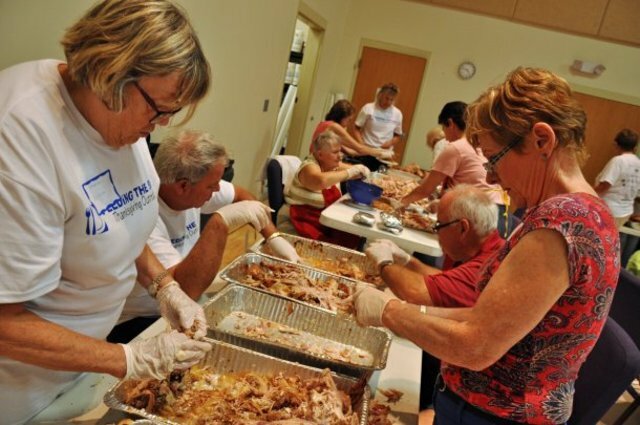 ESTERO, Fla. — Volunteers gathered Thursday at Lamb of God Church to prepare 6,700 meals that went to those in need for Thanksgiving. Originally published on Wink News. Feeding the 5000 fed over 7,400 meals on Thanksgiving Day 2013! This year, over 800 volunteers came together to cook, package, and deliver 7,400+ meals–that’s over 478 turkeys and more than 10,000 lbs of side dishes! In the past 5 years, we’ve provided over 30,000 meals in our community. By Laura Gates. Jesus did it with just five loaves and two fishes. It takes a bit more for Lamb of God Church and its community partners to feed 5,000. The annual Thanksgiving outreach relies on hundreds of volunteers to cook, package and distribute nearly 500 turkeys— along with all the fixings— feeding the needy in a five-county area. The massive effort starts the weekend before Thanksgiving, roasting turkeys in batches of two dozen at a time.